The CoffeeShop Blog: CoffeeShop Tutorial: Creating Fantasy Art with Textures and Free Stock Photos! CoffeeShop Tutorial: Creating Fantasy Art with Textures and Free Stock Photos! I have some really great freebies coming out this week. 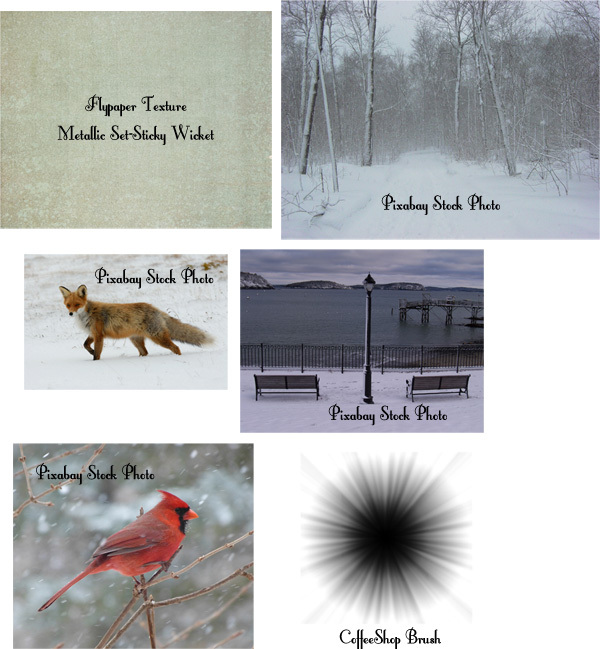 I have a new Photoshop/PSE action and LR preset and some digital design packs. I will also try to throw in an editing tutorial (these take the most time to create but I have so much fun doing them). 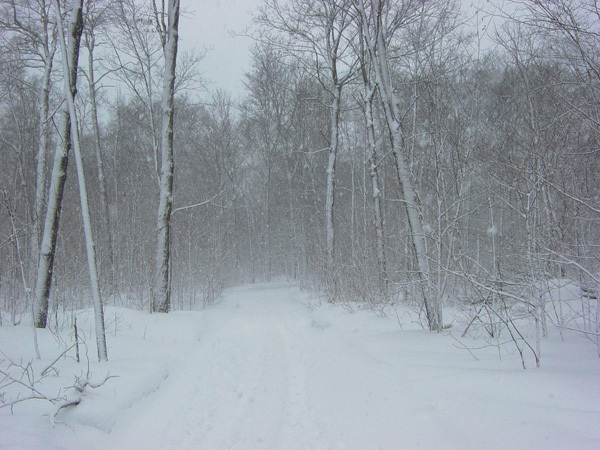 As I was browsing the images I found this really pretty snow scene, perfect for my Narnia artwork. I grabbed a few more design elements I needed for my edit and started playing in Photoshop. Everything was free except for the texture from Flypaper Textures (which has some of the most beautiful textures out there and worth every penny). 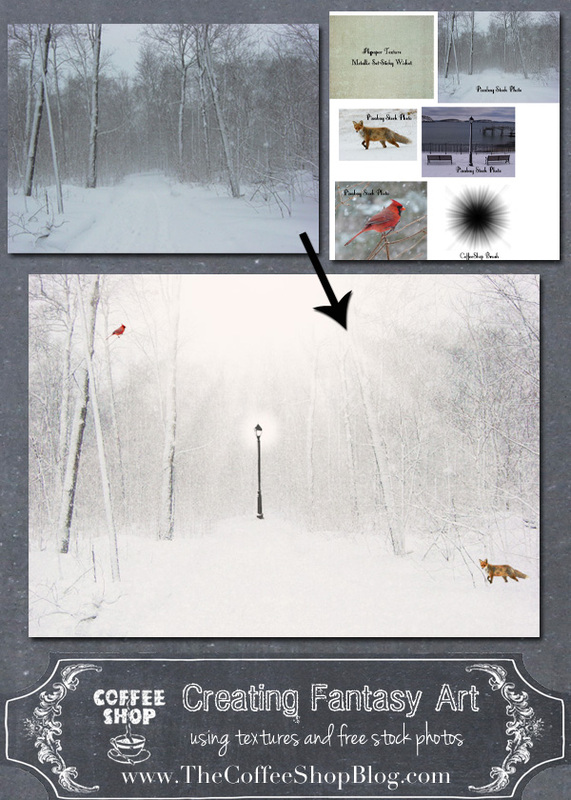 I spent some time cutting out the bird, fox and lamp post and then assembled my image. Here are all of my layers. 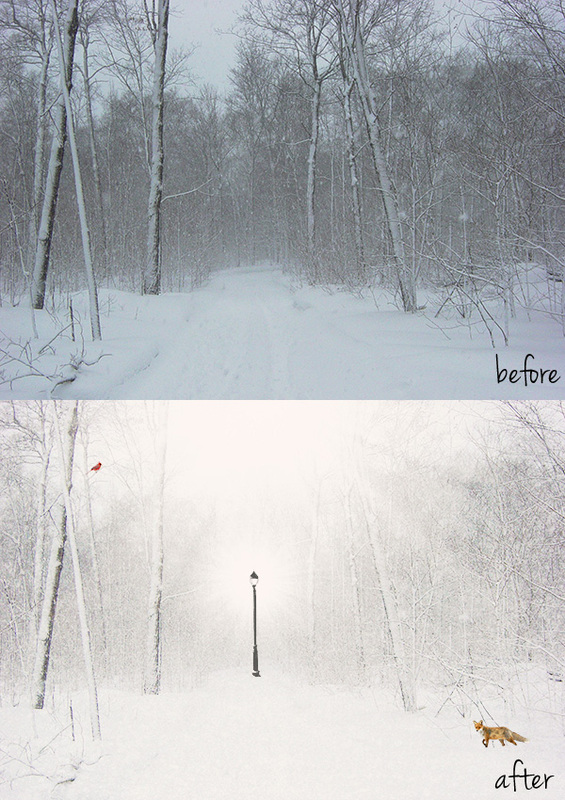 And here is my final edit: A cold winter day in Narnia. I wanted this image to have the feel of a fantasy painting in a children's book and I am really happy with my results. Even new Photoshop/PSE users can have fun creating their own fantasy art. If you want to see some really inspirational edits check them out here. These types of surreal art are one reason I still love to edit on the computer in Photoshop and PSE rather than only using an app on my tablet or smartphone. If you are interested on how I edited this image just let me know in the comments and I will put together a step-by-step tutorial and post it here. Oh, how very creative! Even though it makes me shiver. I'm a Texas girl too and I love sunshine. Thanks for the creative inspiration. A tutorial would be great. Love your result. This is wonderful!! A tutorial would be great! I would love to have a tutorial on how to successfully "cut out" pictures in photoshop! Thanks for your amazing blog. The Lion, the witch and the wardrobe was one of the first books I read as a child. This is a lovely take on it. Would love a tutorial on how you cleaned up your stock images. Tx! Please please please a tutorial!!! I will post a tutorial, thank you!!!! I create fantasy photo collages all the time. This is a recent one and my take on the movie Frozen. I love your blog! Please post a tutorial! Most of it can be applied to Paint Shop Pro X6. I would love to see how you edited this!! Especially the glowing light! !